OMAHA, Neb. (CNS) — From a town of just over 900 people, a Knights of Columbus council and its 162 members hope to have a big impact halfway around the world. As part of their efforts, the Fort Calhoun Knights planned two fundraising events in Omaha March 9 and 10 featuring Syriac Catholic Bishop Barnaba Yousif Habash, along with Gabriel Jabbour, a Syrian refugee, and his daughter and translator Rula Jabbour. Gabriel fled Syria in 2012 shortly before he was to be executed for being a Christian and refusing to convert to Islam. He and his wife, Maya Tayar, joined their daughter in Omaha, where Rula is a member of St. Robert Bellarmine Parish. Bishop Habash was born, raised and served as a priest and bishop in Iraq. Since 2010 he has led the New Jersey-based Diocese of Our Lady of Deliverance for Syriac Catholics in the United States and Canada. 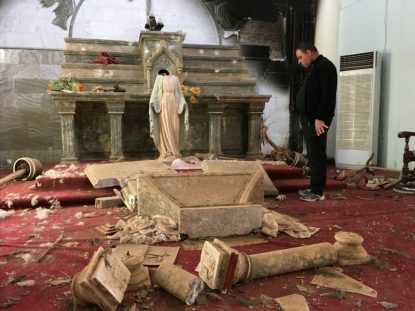 In an interview with the Catholic Voice, newspaper of the Omaha Archdiocese, Bishop Habash described the centuries of persecution Christians have faced in the Middle East. “A 19th-century French historian wrote that the most sacred land after Golgotha is Mesopotamia (the Iraq of today),” the bishop said. “At Golgotha the blood of Christ was shed, but no other land has absorbed the blood of Christian martyrs to the same degree as has happened in Mesopotamia, or Iraq. He said the persecutions and destruction directed by ISIS militants against the Christians in Iraq, Syria and Egypt “are merely repetitions of what has occurred so often previously to the Christians of the Middle East.” But today this is displayed “before all the world” because of mass media, he added. During his recent visits to Iraq, he said, he has “discovered with great sadness the complete lack of caring by the Iraqi federal government and local governments” concerning “their citizens” — the displaced Christians, the refugees. “I found that Christianity is not at all a matter of concern for the Islamic leadership,” he added. Despite their hardships, the people have “a vibrant faith,” he said. “It is as if they say we are ready to lose everything — house, property, possessions, money, everything — but nobody can take the unique pride we have, which is our Christian faith,” he added. Bishop Habash praised relief efforts by the Knights of Columbus and Catholic Relief Services in particular and other nonprofit Christian and other organizations. He said, though, he thinks such efforts in these Middle Eastern countries would be more effective if they were supervised and coordinated by the Vatican nunciature in each of the affected countries. Last August in St. Louis, Bishop Habash spoke about the genocide and persecution of Christians in Iraq and Syria at the Knights of Columbus Supreme Convention. Conrad and Hubschman were there and heard his remarks, which inspired them to do something to help these displaced Christians and refugees. Returning to Fort Calhoun, they discussed with their council the possibility of taking part in the Knights rebuilding project by funding construction of five homes. They quickly raised $10,000, Conrad said. From there, the idea blossomed into March 9-10 fundraising event. May is on the staff of the Catholic Voice, newspaper of the Archdiocese of Omaha. 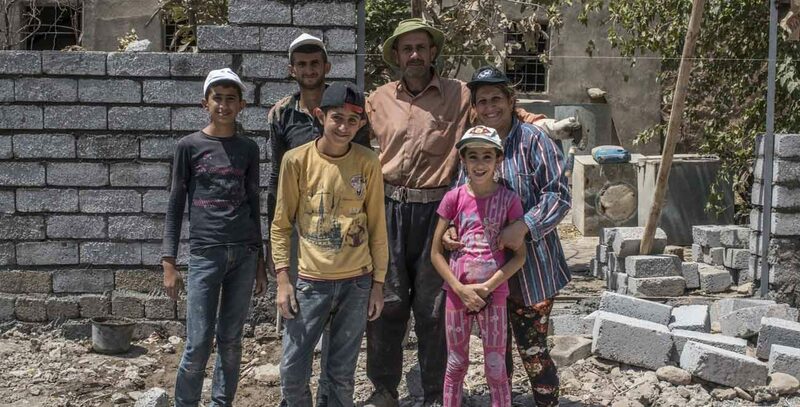 I want to donate to help the Syrian Christians rebuild their homes. I donot see a window that I can click for the Knight council 10305.